While our wonderful Quassa was put down earlier this year, we leave this page up because Quassa was our foundation sire and his influence will always be with us. 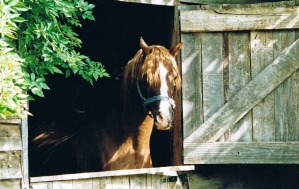 Our senior stallion is QUASSA . (Fable in Arabic). Sire Desert Shadow imp UK ( Desert King - Autumn Shadow - Bey Shadow ) out of Houllain ( Houssain imp Aust - Zillah exp Aust - Sabah imp Aust ).For the interest of Crabbet enthusiasts, Quassa is 90% Crabbet. The remaining blood is Old English and Shahzada. The "Boy" is double registered . While he is of course a Purebred Arabian, his markings have also qualified him for registration with the New Zealand Pinto Horse Association. Although he measures only 14.1 hands high, QUASSA has proved himself to be a tough little horse in the sport of Competitive Trail riding and is also an Open Endurance horse. His standing heart rate is 28 bpm. Among Quassa's accolades are two Silver medals at the Masters Games for trail riding and Second = Intermediate Section at the NZECTRA South Island Champs. 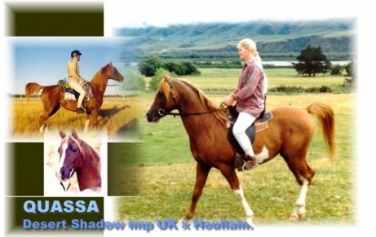 Quassa is leaving quality offspring from a variety of mares. 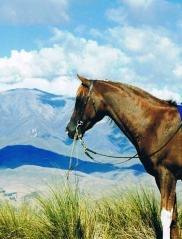 His progeny are situated throughout both the North and South Island of New Zealand and they are good looking. 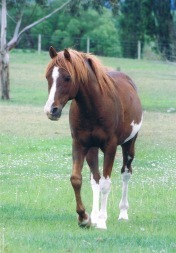 In fact some of his partbred stock have been mistaken for purebred Arabs. His stock are blessed with free and extravagant movement and they are turning heads where ever they go.